[Update] An official blog post went up now on Xbox Wire where Playground Games Creative Director Ralph Fulton shared more details on the Forza Horizon 3 Xbox One X update. Furthermore, Digital Foundry had early access to the update and shared a new video comparison where they noted that Forza Horizon 3 on Xbox One X runs at 4K@30fps with no drops and 4XMSAA on top of it. These enhancements are all about the visuals. We know that our fans really value great image quality, so we’ve taken this opportunity to deliver that to them with this update on Xbox One X. On top of the obvious enhancement to native 4K, there are a number of other improvements we’ve made which really take advantage of the added definition 4K brings. Reflections are sharper and clearer, environment shadows are crisper and better defined, the quality of motion blur has been increased to make the driving experience significantly smoother, and better anisotropic filtering improves the detail visible in environment textures, particularly on the roads themselves. For me, the biggest improvement is in the combination of 4K and HDR though, especially in Forza Horizon 3‘s dynamic time-lapse skies. The sky is such a huge part of nearly every scene in the game that it affects the feel of the game a great deal and the improvements we’ve made to reflections and shadows really complement it. [Original story] The highly anticipated Forza Horizon 3 Xbox One X update is currently being rolled out as we speak. It should be available at 1 PM EST. The game already showed up as being ‘Xbox One X Enhanced’ for numerous gamers, but the update is now finally being deployed to Xbox One X systems. 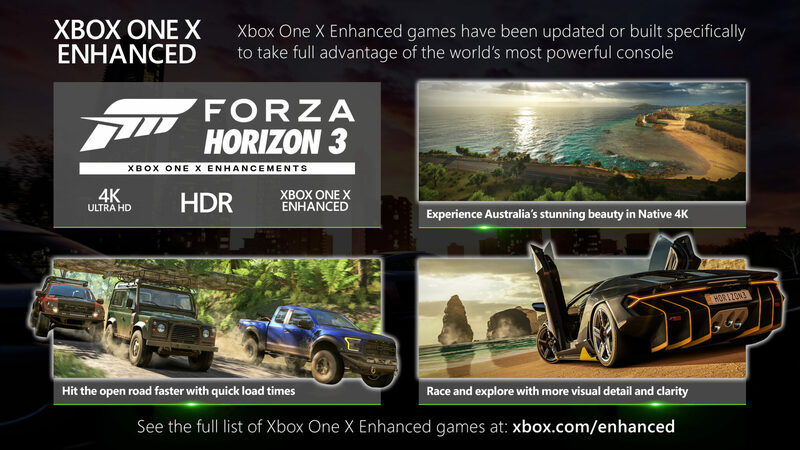 The exact Xbox One X enhancements are unknown, but Microsoft and Playground Games have promised native 4K resolution on the One X.
Forza Horizon 3 was released back in September of last year and already looked stunning on the original Xbox One console, especially with HDR enabled. We’ve included one of the game’s trailers below. Chris loved it when playing on PC. Regardless, Forza Horizon 3 is honestly my favorite driving game right now. It has so much to offer, so much for you to do and see. Not only that, the cars are simply fantastic to behold, and even better go tinker with and modify to suit your needs. Only time will tell, but I can honestly see myself sinking a lot of time into this game, and I couldn’t be happier with it. Forza Horizon offers you a huge world to explore. It gives you as many cars, from supercars to off-road buggies, to race how and when you want. Explore the outback, race along the coast. Forza Horizon 3 is possibly the best racing game in the world, just marred by performance issues on the PC and the dull nature of the create-your-own-race options.